We’ve been getting some strange looks in restaurants recently. Baby Oscar turned a year old at the end of January, and if there’s one thing he loves (apart from Thomas the Tank Engine), it’s his food. Since he was about 8 months old, we’ve been giving him tiny tastes of our restaurant meals, but over the last few weeks, he’s had the luxury of having his own dishes ordered off the menu (and the odd babyccino too). So on a Saturday after January payday finally arrived, we were after somewhere to enjoy a relaxed lunch where we could also treat the baby to something of his own. 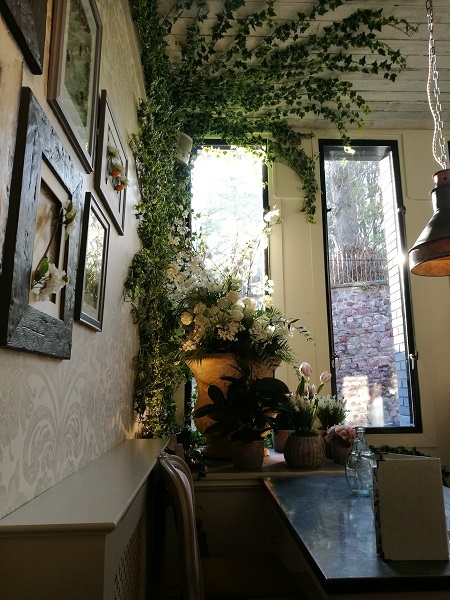 The Florist on Park Street, which opened in early 2018 to replace the longstanding Goldbrick House, fitted the bill perfectly. The woman I spoke to on the phone to book was incredibly helpful, reminding us about the step-free entrance at the back for the buggy, and promising a highchair for the smallest member of our party when we arrived. Even if you’ve not been to The Florist before, you’ll probably have a good idea of its theme from the name. From the birdcage displays in the front windows to the walls of roses and the hanging baskets dotted throughout, the floral theme runs through the whole place…artificial flowers, understandably – it would cost them a fortune to replace everything on a regular basis. While the place still feels recognisable from its Goldbrick days (it’s the same enormous maze of drinking and dining areas that it always used to be), it has a fresh, light and airy high-end feel, and it’s absolutely beautiful with the sun streaming through the windows. The same care has gone into the creation of the drinks menu, with a huge variety of global beers (their “ale inventory“) and a list of cocktails that not only features some intriguing combinations of ingredients, but which offers drinks that look absolutely stunning too. “Discover a culinary experience like no other”, proclaims the menu…and it’s right. There’s no one single influence that can be deemed a theme for The Florist’s menu: the hanging kebabs include flavours from the Middle East and the Orient, there’s an Indian-inspired Tandoori battered cod, there are tagines, gnocchi, pad Thai sides…it’s a bit of a confusing mix. While we waited, we were asked if we wanted some bread for the table…on saying yes, we weren’t expecting a massive loaf to share! 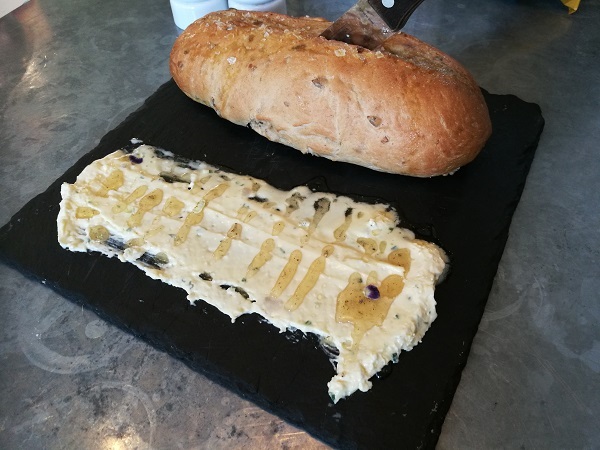 The lavender honey and sunflower bread with whipped goats’ butter (£4.50) was delicious: soft and slightly sweet with the odd hit of flaked sea salt, and the tangy, creamy and slightly grassy butter topped with swirls of floral honey was delicious. 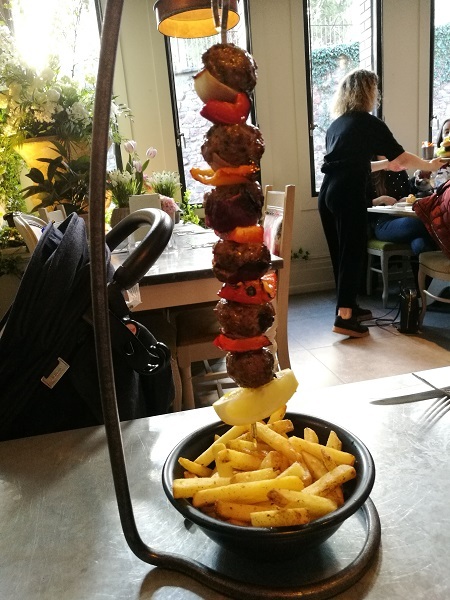 Chris’ main meal decision was an easy one: a lamb kofta hanging kebab with harissa chips (£12.95) and his choice of sauce – he opted for the garlic butter. Beautifully presented, the waitress did the honours of pouring the butter theatrically over the meat, which dripped down through two holes in the top of the metal frame to drench the lamb (and many of the chips). The meat was beautifully tender and pink, with a decent level of seasoning, the accompanying red onion and pepper nicely caramelised and still with a bit of bite. He’d have preferred more of the pungent garlic butter, and for the chips to have been cooked a bit longer, but on the whole he was impressed. For me, a deli board (£11.95), giving me the chance to choose four items from a varied list of 21 that The Florist offer. The highlight was the smoked haddock fishcake, with a decent level of smokiness and plenty of texture. The chunky mango chutney nestled on top set it off nicely, but while the cucumber ribbons were lovely and refreshing, the sauce they came in was pretty sour – and not in a good way. The dolcelatte, poached pear and walnut salad came with the addition of tangy dried cranberries, and was tasty enough, but could have done with more cheese – and with the sugary candied walnuts being broken up a little, as I feared for my teeth. No complaints about the herby polenta chips (and the accompanying truffle mayo was top notch), but the real letdown was the Shorrocks Lancashire mac and cheese. It definitely looked the part, but the sauce was pretty light on cheese – more of a white sauce with a serious excess of black pepper. And the baby? 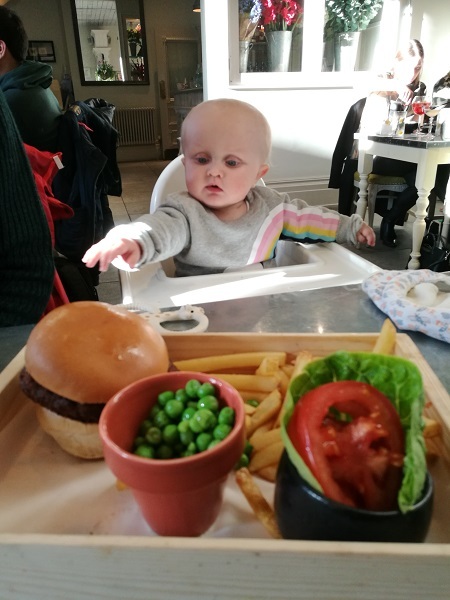 Well, he’s got no teeth as yet, so the falafel burger with chips and peas (£6.95 – price includes a dessert) seemed like a good bet. His chips could have done with a bit longer in the fryer too, but the falafel itself was delicious, packed full of flavour and readily demolished. 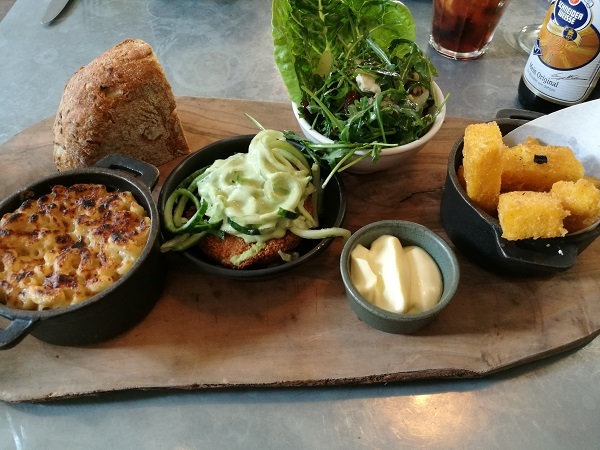 The presentation of his meal was fun, too: a wooden crate to hold the meal, and a small flowerpot (again with the flower theme…) to keep the peas in one place. We ordered the kids’ dessert despite the fact that he seemed pretty full, thinking the grown ups could share it…we barely got a look in. The nutty banana split with chocolate and peanut ice cream – the vegan kids’ dessert option – was brought to the table in a retro glass dish, piquing his interest straight away. 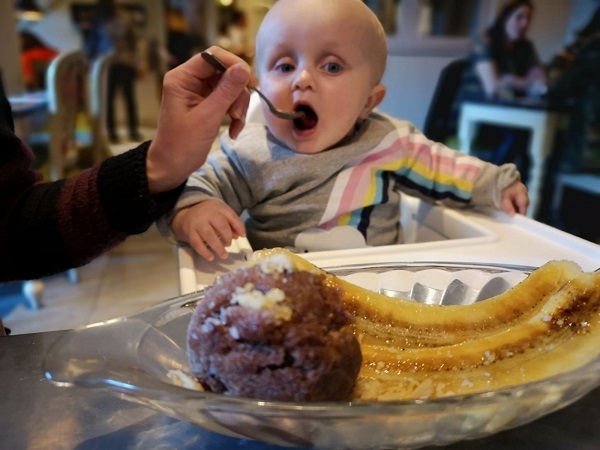 He loved the caramelised banana, a thin layer of crunchy sugar on top, and while he demolished the ice cream, we weren’t that impressed: it was pretty watery without much of a chocolate flavour, but the inclusion of popping candy was fun.